Guided Wilderness cabins along the route Dec-Apr 8 days/7 nights days Fell/mountain forest Ski experience (touring experience not required). Good level of fitness. Guided Guest houses and cabins along the route Feb-Mar 7 days/6 nights Forest, frozen lakes and marshland/tracks Previous cross country skiing experience. Good level of fitness. Guided Mountain station and mountain cabin Mar-Apr 7 days/6 nights Rolling mountains Previous cross country and/or downhill. No touring experience required. Guided Mountain lodge and wilderness cabins Feb 8 days/7 nights Rolling mountains, forest Previous cross country and/or downhill skiing experience recommended but not essential. Guided Mountain stations at start/end, mountain cabins along the route Mar-Apr 8 days/7 nights Rolling mountains/mountain pass Previous ski touring experience required. Good level of fitness. Cross country skiing and ski touring have become increasingly popular in recent years, as travellers become more aware of the negative environmental impact of downhill resorts and discover the enormous potential of this quieter, less intrusive way to enjoy the beauty of the winter landscape. Sweden's fjäll landscape in the north offers tremendous hut-hut touring possibilities, bringing you deep into the mountain wilderness, often using the routes that are also popular as hiking tours in summer. Finland's quiet forests and tranquil nature are perfect, both for our cross country tours travelling between local guest houses steeped in tradition and with a warm welcome, sauna and excellent food awaiting at the end of the day, or for our challenging expeditions into the wilderness of Finnish Lapland. Norway's stunning mountain landscapes offer a majestic backdrop as you explore the lower altitude world of rolling fjells and forests. Nature Travels offers a range of cross county and ski touring holidays, from family-friendly winter breaks to challenging ski touring expeditions. If you have young children, have not skied before or would like to combine cross country skiing with other winter activities, you may like to choose one of our winter log cabin experiences such as Winter Log Cabin Getaway in Päijänne Tavastia. Equipment is available to hire from your hosts and the surrounding forests offer opportunities for cross country skiing right from the door. For those seeking a greater challenge, take the plunge for a dedicated cross country or ski touring adventure! If you have some experience of cross country skiing but are yet to discover the challenge and adventure of mountain ski touring, you will find Discover Mountain Ski Touring in Lapland an ideal introduction to this marvellous sport. A 7-day experience running on the central section of the King's Trail in the far north of Sweden, Discover Mountain Ski Touring combines guided day training tours from mountain station with a cabin-cabin expedition component. Discover Mountain Ski Touring will give you the opportunity to improve your technique and build your confidence for future extended tours under the tuition of your local guide. An alternative option for those getting into touring is Introduction to Ski Touring in Langsua National Park. Like the Discover tour in Sweden, this begins with tours from fixed base and then progresses to include an expedition component. There is a strong learning element for the tour both in terms of developing your ski technique and in learning general winter hillcraft. For those with previous experience of mountain ski touring (and an ideal "next step" if you have already done the Discover tour in Sweden or Introduction tour in Norway), we offer an option for guided tours with additional level of challenge: Ski Touring on the King's Trail from Abisko to Kebnekaise. The Abisko-Kebnekaise tour takes you through the dramatic mountain landscape of Lapland into the shadow of Sweden's highest mountain, Mt. Kebnekaise, following the Kungsleden trail, one of Sweden's best-known hiking routes in summer. Accommodation is in mountain cabins and mountain stations along the trail. One of the world's classic ski touring experiences and an adventure not to be missed! This tour is considerably more challenging than Discover Mountain Ski Touring, as you will be skiing each day with pack weight 10-14kg. It is important if considering this tour that you have previous experience of ski touring and are comfortable with the itinerary. 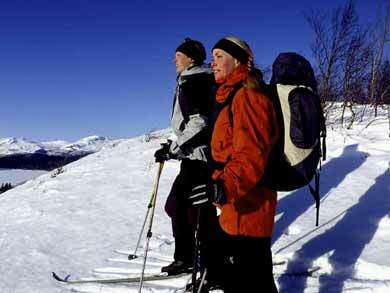 Cross Country Skiing in Eastern Finland is a guided guest house to guest house tour suitable for adults or older children (min. age 15) with some previous cross country skiing experience and comfortable skiing distances of 15-30km with light daypack. There are two levels of challenge available - Discover tours for participants with limited experience and Standard tours requiring greater previous experience. This experience has luggage transfer is included, meaning you will be skiing with only a daypack during the day, and that accommodation each night is in local guest houses rather than wilderness cabins as for many of our other ski tours. Your local hosts offer a warm welcome and insight into the culture and cuisine of the area and of course, being Finland, sauna is an important feature of each evening! Ski equipment is available to hire as an optional extra. 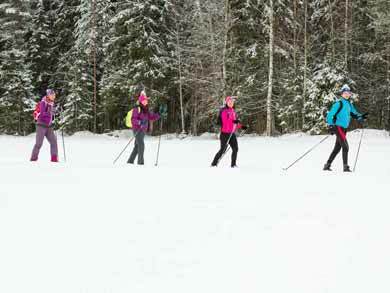 A little further north, in the border region with Russia, Cross Country Skiing in the Finnish-Russian Borderland also offers an option for "classic" cross country ski tours between guest houses and cabins and also with luggage transfer included. The two 7-day itineraries offered here both require previous cross country skiing experience but are at two different challenge levels - one covering around 100km during 5 days of skiing, the other around 150km. As with the Eastern Finland tour, there is also a focus on local cuisine and culture (including visit to reindeer farm) as well as plenty of opportunities to enjoy the Finnish tradition of sauna at the end of the day! In the far north of Finland, Backcountry Skiing and Northern Lights in Finnish Lapland offers two itineraries for hut-to-hut exploring the Lemmenjoki and Halti regions. 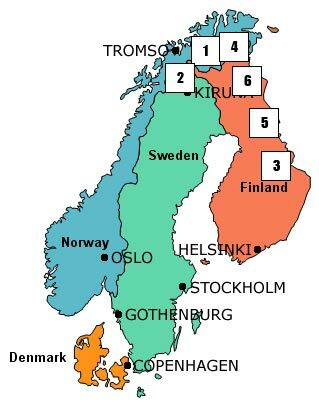 These tours are physically challenging and take place in very remote areas, with accommodation in simple wilderness cabins, but do not require previous ski touring experience, so can be a good option for participants with good level of fitness seeking to participate in a real winter expedition but without the requirement for technique necessary for other options such as the King's Trail in Sweden.